Steam is notorious for its twice (and sometimes three time) annual sales. The sale always features deep discounts on popular titles as well as indie games you may never have known existed. This years first day of Holiday sale Features Skyrim for 19.99 and The Witcher Franchise for both of which are new and a great value. 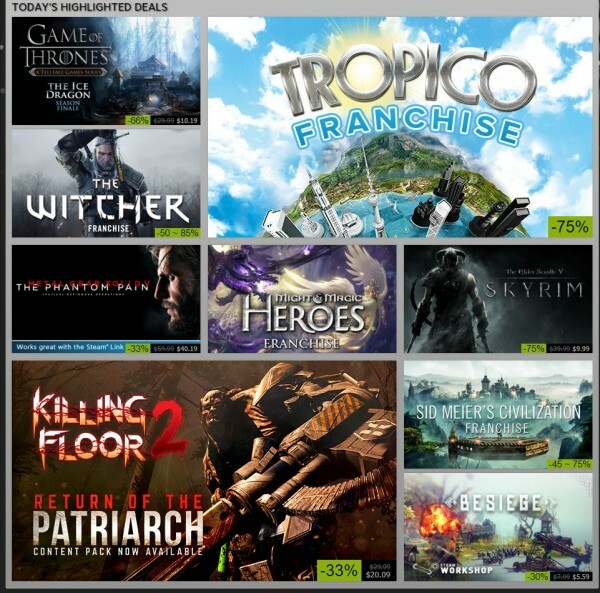 It also features Besiege which is crazy fun, for $5.59 (30%off) and Killing Floor 2 indie titles that for the price point they are at can not be passed up. This years steam sale as always will run for 7 days. Hi, Im fionna Fox! and i love video games. I have been playing video games since I could reach the keyboard. My first PC was a gateway (though dont ask me to recall the model number) and I remember starting most of my games out of DOS. Those were interesting years. My first console system was an Nintendo 64, on which i played a lot of GoldenEye and StarFox 64 and even more gauntlet dark legacy. Now i mostly play PC games, though i do own a Xbox one (mostly for halo). My favorite types of games are rogue likes, and anything thats an RTS, I have a soft spot for anything in the Warhammer universe as well.